Why are you making changes to the FREE PLAN websites again? Because of SPAM. We have done everything we could think of to keep our free plans open to the web. Unfortantely, spammers and their spam robots are abusing our free plan to produce thousands of spam website daily. The time and resources to fitler out these sites has been extensive and has now reached a point were we can no longer afford to support them the way they are. Why are there now TWO types of free plans you can sign up for? 1.) Use A Credit Card To VALIDATE Who You Are. No charges will ever be applied to your card. We don't even store your credit card information. We only use it once to validate that your are a real person and (hopefully) not a spammer. The good news is that if you sign up this way, your website will be fully visible on the web and the old 'splash page' will be gone. This is the best way to enjoy our free website builder. 2.) Make A Private Website That Requires Logging In To View. Only you will be able to see the website. You will need to login to view it (see image above). This will allow you to test out our free website builder and actually even build a full website. If you like it, you can choose to upgrade and make it public. 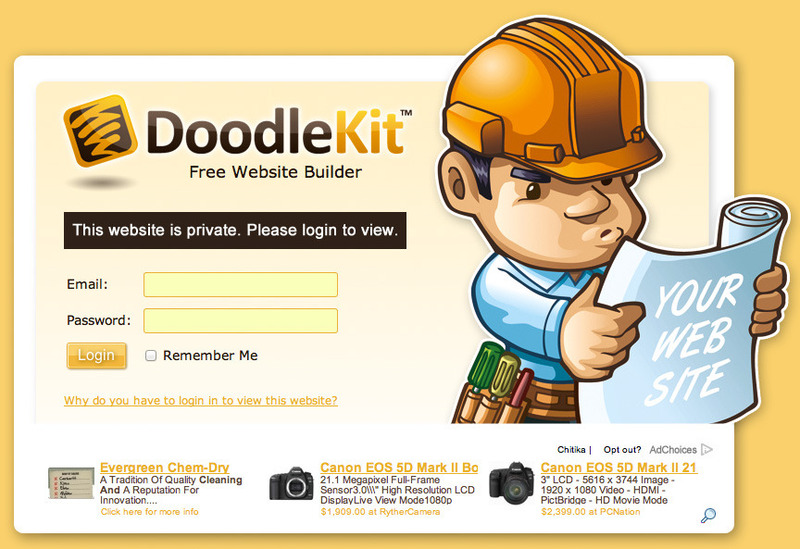 What if I already have a free website with Doodlekit? If you already have a free website with us, you will be grandfathered in. No changes will apply except that the old Ad Splash Page will go away. Will this finally stop spammers from creating spam websites? No. But it will bring spam back to a more managable level. We will continue to monitor all our websites no matter which plan is used.